Be the first to share your favorite memory, photo or story of Celesta. This memorial page is dedicated for family, friends and future generations to celebrate the life of their loved one. 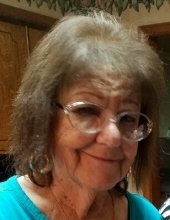 Wynell Reneau, of Angleton, passed away peacefully, January 27, 2019, surrounded by her loving family, after she had fought a courageous battle with Pancreatic Cancer. Wynell was born August 10, 1943 in Liberty, TX to Ralph and Helen Williams Sheffield. Wynell married Thomas Reneau April 19, 1962. She is survived by her husband, Thomas; son, Brent Reneau; daughter, Jean Rhodes; brother, Billy Lassiter; grandsons Jimmy Solis Jr. and Andrew Zambada; and two great-grandsons. She is preceded in death by her parents; brother, Reginald Sheffield; sister, Vivian Ruth Sheffield Stegall; and granddaughter, Jacqueline Solis. Wynell loved painting and was a member of the Brazosport Art League, but most of all she loved her family and friends. The family wishes to give thanks to all the caregivers at A-Med Hospice who cared for Wynell during her illness. There will be a friends and family celebration of life at a later date. To plant a tree in memory of Celesta Wynell Reneau, please visit our Tribute Store. "Email Address" would like to share the life celebration of Celesta Wynell Reneau. Click on the "link" to go to share a favorite memory or leave a condolence message for the family.